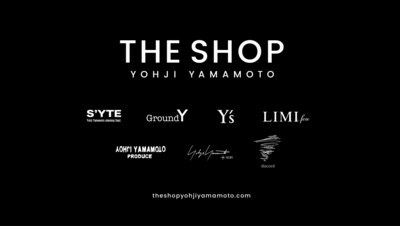 TOKYO, Aug. 22, 2018 /PRNewswire/ — Yohji Yamamoto Inc. will launch a global e-commerce website THE SHOP YOHJI YAMAMOTO on August 22, 2018. It will be displayed in English, and the transactions will be in US dollars. The webstore will present the web-only brand S’YTE, and other brands such as Ground Y, Y’s, Yohji Yamamoto Produce (web-only products), Yohji Yamamoto + noir (web-only products), discord Yohji Yamamoto, and LIMI feu, etc. S’YTE and Ground Y will mark their global debut on this day, as these two brands have only been available in Japan. The visitors will be able to shop with VISA, MASTERCARD or PayPal. The delivery will be available in total of about 130 countries across the world using EMS. THE SHOP YOHJI YAMAMOTO incorporates many features and functions that enhance customers’ online-shopping experience. Models are used for the pictures of the goods sold on the webstore to help customers better understand the products. In addition, there is an individual page for each brand and a lookbook feature to demonstrate to the customers each brand’s concept. After the launch, the company plans to release an app in the early September. The company also plans to launch the Chinese language webstore later in the same month. S’YTE – is named after reading backward “et Y’s”, which means “with Y’s” in French. Launched in September 2011, S’YTE is a web-only brand with the positioning as an entry brand to Yohji Yamamoto. Ground Y – proposes a new fashion concept – genderless and ageless style – through synchronizing different aspects of Yohji Yamamoto. Suitable and thus widely supported from all genders and ages, Ground Y provides a variety of its popular goods. Y’s – Functional and dignified everyday wear–within a unique category established by itself, the collection is shaped by universal values and unique pattern-making. It presents high-quality ready-to-wear clothing through which the atelier team expresses the brand’s identity. YOHJI YAMAMOTO PRODUCE – managed by Yohji Yamamoto’s atelier team, reproduces the archived smash hit products of Yohji Yamamoto, and is positioned as the entry brand to Yohji Yamamoto pour Homme. Yohji Yamamoto + NOIR – expresses Yohji Yamamoto’s worldview through casual wear. Themed around black, it pays great attention to the volume and balance of fabric, and conveys trend-free classic, elegant, and refined gorgeous value of Yohji Yamamoto. Web-Only products will be available. discord Yohji Yamamoto – launched in 2014, it provides a new sense of value through luxury accessories created by Yohji Yamamoto. The word “discord” reflects the aesthetics of incompleteness and asymmetry that are the philosophy of the designer. LIMI feu – emphasizes the ambience, volume, and comfortableness by removing excess, and purposely leaves the blank space for one’s personality to blend in. Detaching herself from the normalized trend, the designer Limi Yamamoto put in her ongoing feels and wills in the straight and clean straight-line silhouette, while combining it with the original voluminous drape that surrounds the body.